An exceptional and delicate aromatic blend with bergamot notes. Also available in packs of 25s. Other flavours to complete the range are English Breakfast, Decaffeinated, Green Tea, Green Tea with Jasmine, Peppermint, Lemon and Chamomile. 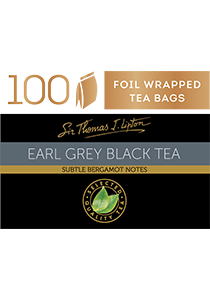 An exceptional blend of fine teas, with subtle Bergamot notes. Weight - 200 g. Weight per serving/portion - 2 g.